You will need 5 small baked bean cans for this. Lightly grease them with butter and line them with doubled greaseproof paper. If you’re not sure how to do this take a look a quick look at this excellent video. To decorate allow 25g (1oz) each of marzipan and ready made icing. Divide the mixture evenly between the five tins and cook at 100 º c/Gas mark 2 for 2 hours (or when a skewer inserted through the middle of the cake comes out clean), check after 1½ hours to ensure the tops are not burning. If they are, just cover with foil until the end of cooking. Allow to cool in the tins. When the cakes are cold, carefully remove greaseproof paper and brush tops with jam (apricot is good, but otherwise just use what you have) and rollout the marzipan and icing to fit the top. Trim to closely fit the cakes. You can personalise these cakes by rolling out scraps of icing to form an initial or you can stick on a small gift bow with a small ball of icing. These make great little gifts for small families who wouldn’t normally bother with a huge Christmas cake and they would sell well in Christmas markets/boot sales. 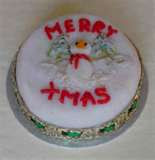 thank you was looking for exactly this to make mini xmas cakes to decorate and give as presents ..